Tissue engineering can't expand into three dimensions as long as cells can't access oxygen and nutrients via blood vessels. This remains a big challenge for the printable organ and tissue engineering communities. 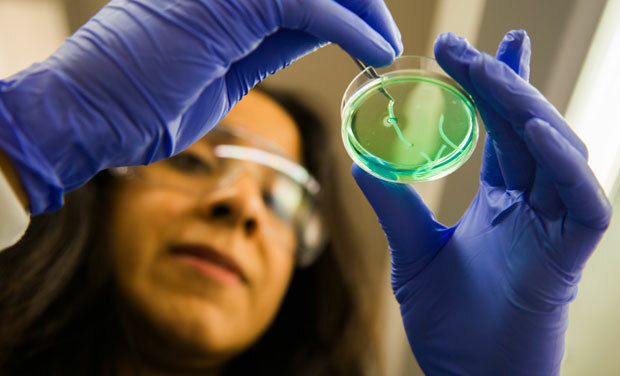 Monica Moya and Elizabeth Wheeler, biomedical engineers at Laurence Livermore National Laboratory, are working on a way to solve this “plumbing problem,” as Moya puts it, using 3D bioprinting. Moya has previously developed microfluidic devices to test the effect of mechanical cues on vessel growth, and published her work in the journal Lab on a Chip. Now she and Wheeler are collaborating on moving to a 3D printing platform. Lawrence Livermore National Laboratory published a blog post last month describing their recent work. First, they had to make sure that the printing techniques were compatible with cell viability. They had to change out the extrusion and fluidic parts of a standard 3D-printer, to eliminate the high temperatures and shear forces that would kill the cells. The bioink, a fluid with biological components, contains endothelial cells, fibrin, and fibroblast cells. The viscosity had to be finely controlled, so that it would remain liquid inside the printer, and gel once in contact with the bed, to print out the tissue support for the vessels. To make tubular vessels, a mixture of alginate (a polysaccharide isolated from seaweed) and fibroblast cells, is printed from a coaxial needle (a needle within a needle) resulting in printed vessel structures, called biotubes. Finally, more tissue bio-ink is laid down, enveloping the biotubes. The biotubes are hardened by flowing calcium solution through the tubes. The tissue patch starts to grow its own vessels, but it looks like spaghetti, with no organization. The alginate and calcium tubes eventually dissolve, leaving the vessels formed by the cells. Future planned developments include directing the vessel formation with nutrient and mechanical cues. Moya and Wheeler did an AMA on Reddit back in December to discuss their work with interested members of the public. They have made tissue patches the size of one square centimeter, the size of a fingernail. Future directions include larger tissue patches. Potential applications of this work include drug testing, toxicology studies, and implantable tissues. Moya and Wheeler’s work is part of a larger project called iCHIP (in vitro Chip-based Human Investigational Platform) looking to create a “human on a chip” where different teams are working on making tissue models of the stomach, liver, heart, kidney, brain, blood–brain barrier, immune system, and lungs, also described in a blog post on the Lawrence Livermore National Laboratory website.